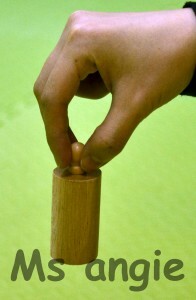 Knobbed Cylinder aiming to refine the children’ precepion of dimension. Such as size, depth, etc. There are four sets of knobbed cylinder which are deisnged into different grading of size/ depth. 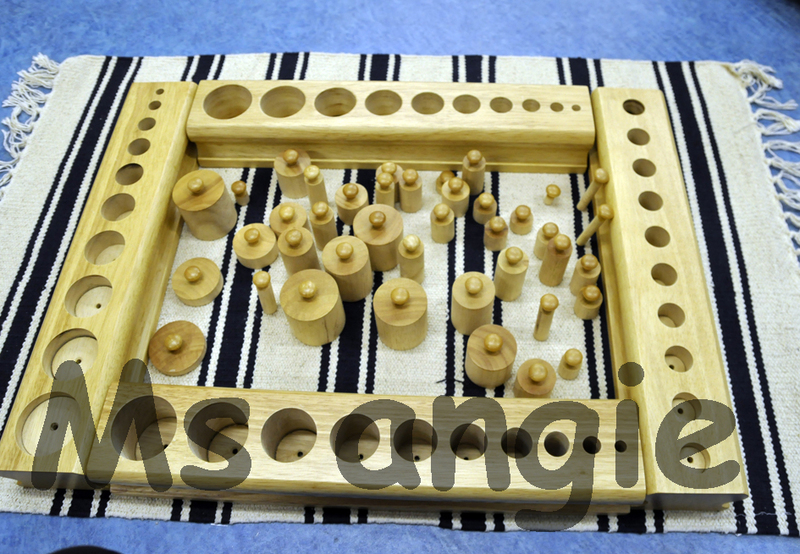 Througt putting the knobbed cylinders into the sockets the children can obtain the preception of dimension. Unlike traditional way, when teachers introduced this kind of absract concept, most of them are using picture card or other daily objects which are not prefectly designed. Also you will note that the each material is in single color/ attribute becasue Maria Montessori wanted to isolate the difficulites whenever introduce the concept. This is the reason why her method can keep going on to this modern society. This is the how we hold the knobbed cylinder. So another aims of working this material is helping the children develop their pencil grip. 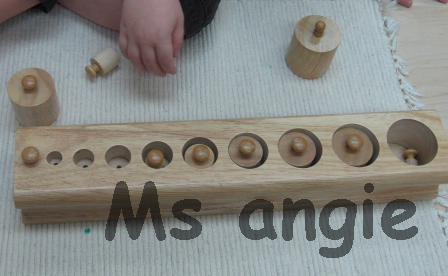 One of the children putting the small knobbed cylinder into the biggest socket and said “It doesn’t fit, Ms angie” Then he similed and removed all the unfit knobbed cylinders put them into the right sockets. The other children, she was very concentrated on examing whether the big cylinders can fit into the small sockets. 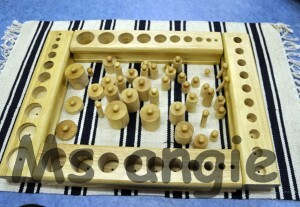 Lastly children can work with all sets of knobbed cylinder in one go.